Clarence: This week we’re having a look at the story of Percy Fawcett, a military officer and explorer who became a minor celebrity in the UK and US due to a series of expeditions he made to the jungles of Brazil. In 1925, Fawcett and his eldest son disappeared while searching for the Lost City of Z (pronounced “Zed” by the Brits, so I will too), a place Percy was convinced held the remains of an ancient, vibrant civilization of native South Americans. 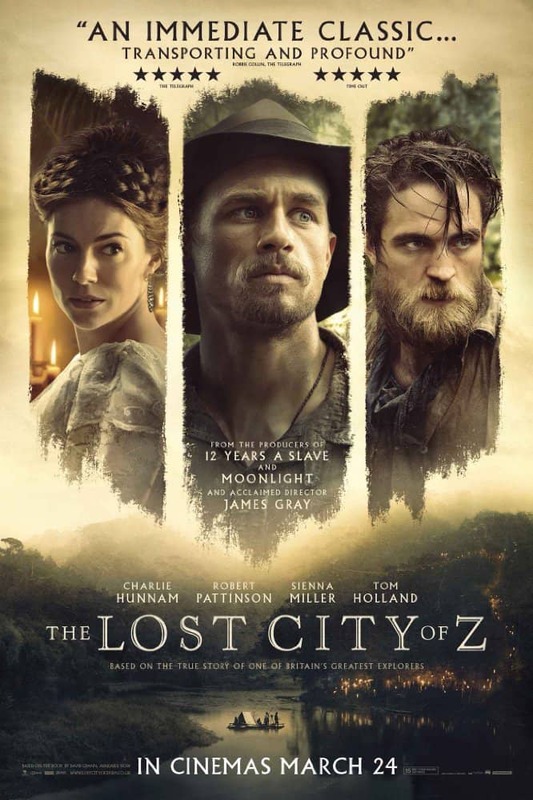 The movie is based on David Grann’s NY Times best-seller The Lost City of Z: A Tale of Deadly Obsession in the Amazon. We’re not dealing with an Indiana Jones fantasy here, but a serious interpretation of a historical figure. As such, I feel it misses several marks. Structurally, the film has some problems. I’d say the overall pacing is “stately” and “measured” (polite ways of saying “dull”). At the same time, the film tries to dramatize more than 20 years of Percy’s life in one 2+ hour film, which results in a lot of narrative fast-forwarding. For example, there are several sequences that show the arduous journeys up river, the explorers barely staving off starvation, disease, and attacks from natives. Then, when they hit their objective, there’s a smash cut to the characters back in England. The editing choices make it seem that it’s a lot easier to get out of the jungle than to get in. From my 21st century left-wing American perspective, it felt like the film makers (including Producer/Writer/Director James Gray and Executive Producer Brad Pitt) tried to use modern social sensibilities while ignoring others. In one scene Fawcett’s wife goes on a feminist tirade about why she can’t join her husband on his expeditions, protesting that the fact that she’s borne children proves she’s as tough as any man. The other fact that she has no skills, training, or experience exploring a dangerous jungle 1000 miles from home, something her husband has been doing for years without objection from her (I’m assuming) isn’t really considered in the argument. The general point is a worthy one, but that scene stuck out as a little tough to keep in historical context. Also, while the film goes to great lengths depicting the dangers of the jungle, it ignores the dangers posed by the white explorers who ransacked resources while subjugating the native people who haven’t been killed off by the infectious diseases brought from Europe. From that perspective, it makes a little more sense that many tribes’ first response to the sight of a group of white men on a boat is a hail of arrows. Then there’s the big question of why someone would subject himself, his workers and his family to such peril and dread over and over again. The story posits Fawcett as a forward-thinking champion of native peoples, as if his ultimate reason for finding The Lost City is to prove the Equality of Man. Salvaging his family’s reputation (his father died in drunken societal disgrace), promoting the interests of the European corporations who sent him to Brazil in the first place, and gaining fame and fortune for himself (British explorers were quite the rock stars at that time) are reasons that are all touched on at certain points but quickly pushed into the background, which I feel is historically and dramatically dishonest. I’ve been reading some reviews of this movie that talk about how refreshing it is to see this kind of throwback to an earlier style of filmmaking. I’m not convinced that’s the case. If anything, this movie is another example of the dangers of romanticizing history. So, Kevin, did this movie work for you either as entertainment, historical enlightenment, or maybe even psychological study? Does Fawcett the man hold any interest for you after seeing his story? Kevin: I generally don't like to read a great deal about a film before heading into the theater -- I often go in armed with nothing more than a brief snippet of the plot/genre from Rotten Tomatoes, along with a sense of the amalgamated reviews (either via RT or Critics Roundup, etc). However, I'll often wind up reading a great deal about the film afterwards; usually in the interest of exposition, but sometimes in an effort to understand any disconnect between me and the army of professional cinema critics. I've learned that I can't put much faith in reviews of comedies, given the subjective nature of humor and my own, er, peculiar tastes where laughs are concerned. But it is surprising for me to come across a drama as well-reviewed as Lost City of Z and walk away a bit nonplussed. First off, for a tale presumably sold as an adventure in the Amazon, surprisingly little screen time actually takes place there*? I didn't expect the film to necessarily conjure up memories of Indiana Jones (as you mentioned) -- though that franchise popped into my head during one sequence that resembled poor Indy's escape from a swarm of Hovitos in Raiders of the Lost Ark. And yes, weeks of presumably arduous travel get handwaved away on multiple occasions; during one such instance, the intrepid explorers are at their wits end, battered by the elements and bereft of rations... and in the next scene, good ol' Percy is ensconced back at home with the wife and kids. Moving right along! Perhaps this film would have fared better as a television miniseries, to avoid such pinballing? We even got a taste of trench warfare in World War I here! To answer your question, I felt Lost City worked best as a slice of history, and a longer timeframe would've allowed more opportunity for the filmmakers to flesh out exactly who Fawcett was -- and more details of how his family name came to be so besmirched. In addition, we'd learn more about his two expedition comrades (played by Robert Pattinson and Edward Ashley), who seemed to be quickly airbrushed into the proceedings. As far as the modern sensibilities embodied in Fawcett's wife, I did a bit of internet searching to see if perhaps that depiction was accurate? But there doesn't seem to be much written about her, so your suspicion that such feminist leanings were a Hollywood creation seems likely. I don't have too much of an issue with the use of her as a moral compass, though it does seem a bit strange that Fawcett inspires such devotion in his kids (even taking along his oldest son on his last voyage) despite the fact that he was absent for huge stretches of their childhood. Have you ever seen either Aguirre, the Wrath of God or Embrace of the Serpent? The former is a Werner Herzog classic, the latter a Colombian film which garnered a Best Foreign Picture Oscar nomination a couple of years ago. Percy was rather zealous about his pursuit of Zed, but even this drive didn't really hold a candle to the obsession that inspired the aforementioned Aguirre. And Serpent was masterful at showing how the war for the valuable rubber crop (combined with the encroachment of missionaries) essentially destroyed the local tribes. Clarence: I watched Aguirre, the Wrath of God more than 10 years ago, and I still haven't recovered from it (in a good way). It's a masterpiece that demonstrates the power of film to depict universal themes, in this case the sheer terror and existential dread lurking around explorations to far-away places. It's on my list of movies like Requiem for a Dream and Dogville that I will gladly watch again if prompted but don't treat like casual fare. Native peoples have always gotten the short end of things in British and American movies, and I don't think the situation has improved much since the days of Gunga Din. The problem is that in most of these natives aren't people, but props to either fill in the background or provide various kinds of cannon fodder for the main characters. The biggest achievement a native person can accomplish is to be tapped as a confidant or main helper for the European hero, adopting "civilized" ways of dressing and thinking along the way. An Indiana Jones film can get away with this because it's clearly a comic book set to the screen. Serious attempts to portray this kind of history don't have that luxury anymore. The only long-term solution to this slanted view of native peoples (as well as different ethnic groups, women, LGBTQ people, and others) is to continue working to get different voices into key filmmaking positions: Directors, Producers, Executive Producers, and Studio Heads. We see this on TV right now with the elevation of Channing Dungy to president of Entertainment at ABC, which has a very diverse lineup of dramas and comedies where non-[fill-in-the-blank] people are not just background pieces or automatic bad guys, although Muslims are still disturbingly fair game for this kind of treatment overall. Because of the nature of production, television has always been more responsive to cultural shifts than movies. But there's very little room for motion pictures to continue doing things as they've always been done. There is one exploration sub-genre that's alive and well: space exploration. The whole premise of Star Trek, the most successful exploration saga in history, is based on the idea there are no more "natives" on Earth and humans can turn their energies to higher-level pursuits. The most effective discovery sequence I've seen is in the movie Contact, starring Jodie Foster as a scientist who becomes the first human to communicate with alien life. The scenes where her team locks in on the alien signal and decodes the messages it contains are spine-tingling. You really get a sense of the ecstatic nature of finally finding something you and others have spent so much time and energy looking for. I think the general public is pretty much over the whole concept of discovering new tribes. It's just the nature of the world we live in. Am I painting with too broad a brush? And when it comes to Earthbound exploration, is there anything left to discover that is worth dramatizing on film? 2) Showing the destructive effects of Western colonization would likely leave American audiences not feeling terribly good about themselves? Which is absolutely fine by me, but probably not something a studio is chomping at the bit to deliver. Perhaps this is a reason that we haven't seen a proper American adaptation of the Chinua Achebe classic Things Fall Apart? Sometimes, though, audiences can surprise you -- they turned out in droves in 2006 for Mel Gibson's Apocalypto, a subtitled epic (certainly a rarity for a major studio release) about the last days of the Mayan empire. There were questions about its historical accuracy, but all in all, it was a powerful film which garnered much critical acclaim. Congrats to Ms. Dungy! And ABC in general, even though network television tends not to be a place where many risks are taken these days. (I'm trying to think of the last network show I watched -- maybe Lost, 10 years ago?) As far as the demonization of Muslims -- well, while this still continues today, it was actually far worse decades ago! Jack Sheehan has written a great deal about this particular Hollywood target, and there's a great 60-minute documentary called Reel Bad Arabs (based on his book of the same name) which explains this particular history in great detail. As far as Earthbound exploration, I generally agree that we seem to have gone as far as we can in that capacity, but I'll suggest one more Werner Herzog film -- the 2011 documentary Cave of Forgotten Dreams. It's about a recently-unearthed series of caves in southern France that contain some of the oldest known artwork in human history. How did we view the world at the dawn of civilization, when so much of it was clouded in mystery? Incredibly thought-provoking, and also one of the few films that actually worked well in 3-D -- sitting in the theater, I felt I was navigating the tunnels right alongside the spelunkers. That sense of discovery you mentioned? I felt it there. Share May 5, 2017 • http://chrp.at/1pYI • Share on Facebook • Tweet This!